To shave, one typically uses some cream or gel. 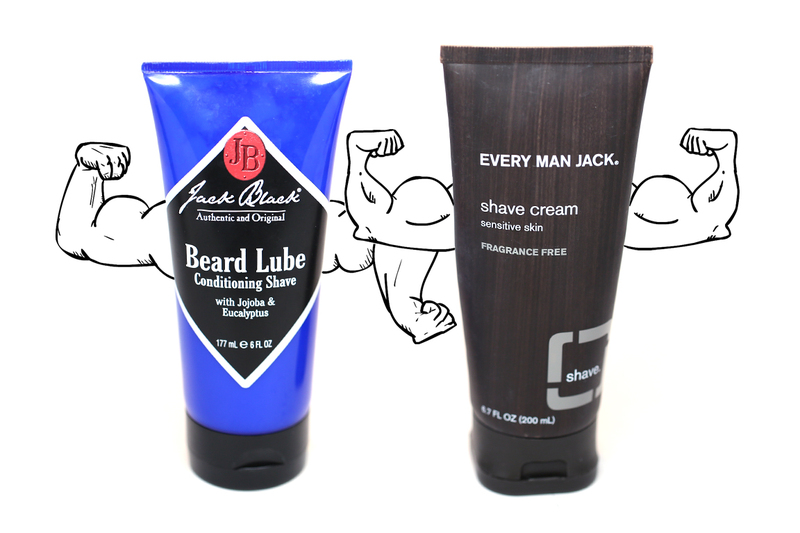 Enter our two contestants: Jack Black Beard Lube and Every Man Jack Shave Cream. Let’s see how these two shaving creams stack up against each other in the battle to be my favorite. Every Man Jack recently shed it’s cool black and white color scheme so it could look like a piece of wood. It does have a square base for better stability and slightly more product (6.7 oz) than Jack Black (6 oz). Meanwhile, Jack Black has a bright blue color that makes it easy to spot on your car dashboard or wherever you might be shaving. My first time trying Every Man Jack was almost a euphoric experience. I had spent so much time using cheap gels that I thought shaving always had to be a dry, face-destroying journey. Every Man Jack instead has this thick consistency that makes for a gentle shaving jaunt. However, the thickness can make it feel like more needs to be applied, and cleaning gunk out of your razor can be a pain when it clumps in the blades. 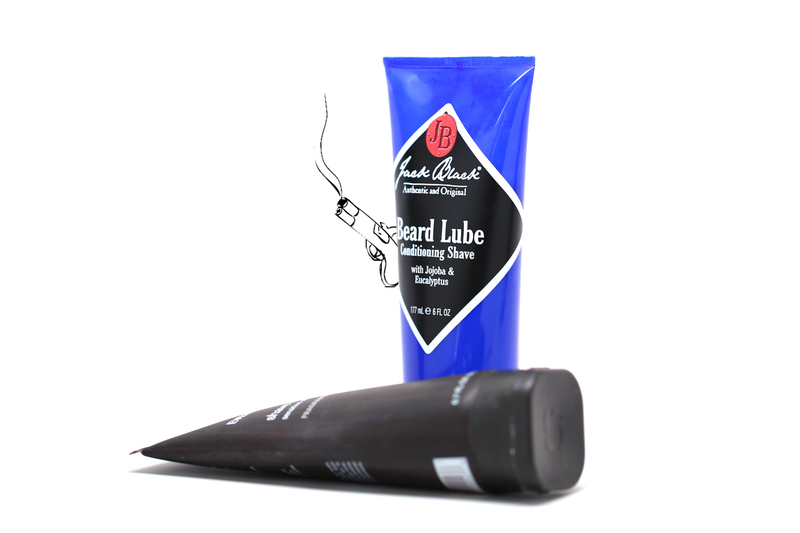 Jack Black is actually more gel-like, and the jojoba/eucalyptus give a clean, tingling sensation as it goes on smoothly. It seems like less product is used per shave, which is a plus, and the ease of cleaning the blades is almost unfair. The eucalyptus also gives it a minty aura (Jen told me to call it “scent” but I prefer aura) that makes my face feel ultra fresh. Honestly, I feel like these are both comparable products depending on what you value when shaving. For sensitive skin, Every Man Jack is gonna be your flavor. For a quick run with an easy clean, Jack Black is your potion. Every Man Jack is considerably cheaper though, which I think makes it easier for people to pick up (despite being sold only at Target and online). In the end, I love both of these Jacks. Jack Black is my current favorite, for its unique feel and how flipping easy it is to clean off the blades. However, I fell in love with Every Man Jack for a reason and that’s why I keep going back to it years later. The thick texture and sensitive skin formula makes for one satisfying shave, but be prepared to prepared to flush a lot down the sink. Aw, what a great idea for a guest post! Hi Ben! lol,hahahahaha!! Ben is too funny!! I'm not even interested in man products but I got to the end of this review and got a friend to read it! * leaving to get Jack Black* for my boyfriend. I really want a wiff of this minty aura!! haha!! I'm glad you enjoyed it! Yeah, Black Jack is excellent smelling. The best smells. Excellent review -- these are two brands that my husband uses interchangeably. Strangely enough, he's been having trouble finding the Every Man Jack after shave in stores. We used to have no issues finding it in the past. He's been ordering it online. Ben, have you tried the Dollar Shave Club? I would love reviews on that too for your next guest post on From Head To Toe. Jen, thanks for including something for the guys! We gals love to know these things for gift ideas! Thanks! I feel like Every Man Jack hasn't been as available as it used to be. I'm not sure if it was an issue of rebranding, but it is definitely weird. I'll look into the dollar shave club. I've heard good things! Loved this post, great job Ben! My hubs has suuuuper sensitive skin and so I will recommend he try one of these. :D Saw another blogger previously mention the Dollar Shave Club, I wonder if that's any good, Ben have you given it a go yet? If so, I'm sure readers would love to hear your opinion. I haven't tried the dollar shave club yet, but I'll give it a shot! LOVE the images, haha, they make shave cream seem so adorable! I love Jack Black, especially their lip balm and hand cream! I might smell a bit like a man when I use it, but it leaves my hands soft without the greasiness! Good Job Ben! Great post! I showed this post to my boyfriend and after reading it, he wanted to try Every Man Jack. But when I went to Target, they were sold out, they only had the lotion. I ended up getting Cremo Cream because it had such good reviews on Amazon. Anyway, my boyfriend ended up really liking it! So if you want to try a new shaving cream, you should check out Cremo Cream :) There's one for women too!